Green which is located in Financial District of New York City Manhattan. It was appointed by investment firm State Street Global Advisors (SSgA) in order define the representation of women in their senior leadership. “ Know the power of women in leadership”, the plaque below the statue states. 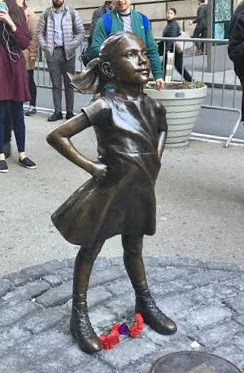 The message of the Fearless Girl is meant to “ send a message” about the gender assortment in the working environment. The statue was permitted to stay originally only one week by City Hall but later extended for 30 days. Eventually, it was announced that it would stay in the same place until the February of the next year 2018. Initially, the company had considered installing the statue of a cow instead of the girls in order to symbolize the women empowerment. After the installation, its attracted widespread media attention and controversy. It was to symbolize the company policy, which runs the women owned company. Different people have different versions regarding the Fearless girl. Many of them think that it represents the women taking on Wall Street and anybody else standing up to the financials firms but some women think that there is nothing relates to the empowerment of women. The statue of a young girl with her hands on her hips, standing defiantly in front of the charging bull of Wall Street. It was placed to celebrate the International day, which has different impacts on the people. It has an impression and upset to the people equally but about 40,000 over signature were collected to make it permanent on its place. Some have derided the statue stating the fake corporate feminism.